Peanut Butter Pretzel Bites Recipe – The whole family will love this simple and quick, three-ingredient sweet and salty treat. Great for gift giving as well! Happy Friday! I’m back again today (twice this week!) 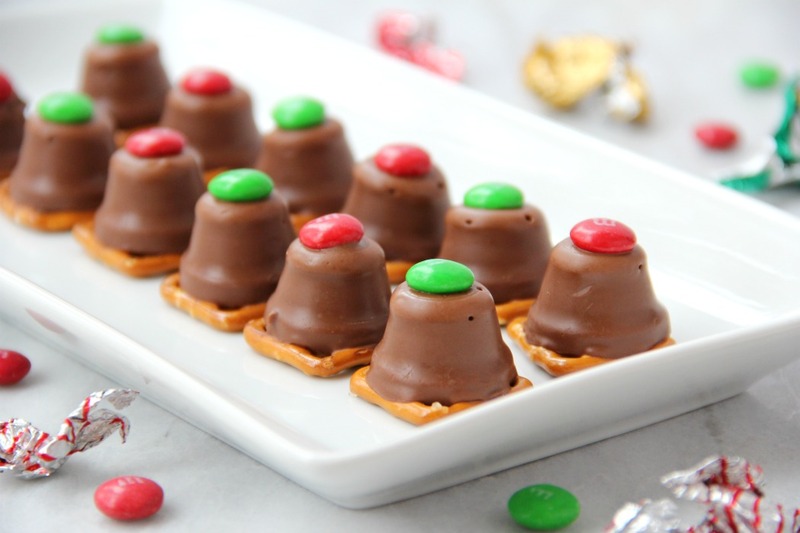 with another easy Christmas candy recipe. I’ve been cranking out Christmas candy recipes left and right in the hopes of providing you some inspiration, as well as peace of mind, when it comes to getting ready for the holidays. 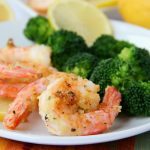 The one thing you MUST keep in mind this month when you’re thinking about entertaining and feeding your family and guests. . .delicious doesn’t have to be difficult – and shouldn’t be. 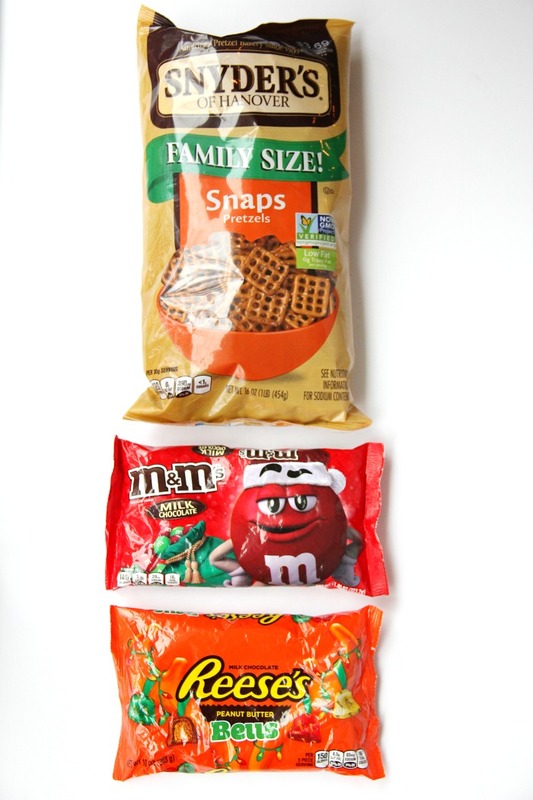 I was looking to use up the rest of the pretzels and M&Ms from the Pretzel M&M Hug treats I shared on Monday. This was a PERFECT solution. Peanut Butter Pretzel Bites are a little sweet, a little salty and a whole lot of delicious. 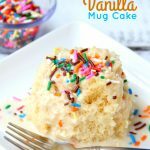 The M&M Hug treats I just mentioned are very similar to this recipe. I’ve seen people make them with Hershey’s Kisses and Rolos, too. All versions are pretty yummy. 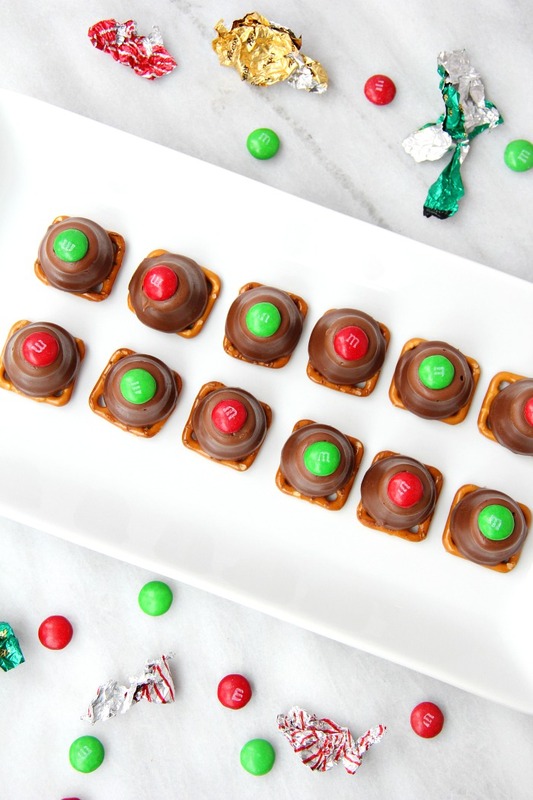 THESE bites, however, use Reese’s Peanut Butter Bells. So, if you’re a peanut butter fan like I am, you’re in for a real treat. Literally. You can find the peanut butter bells in the holiday candy section of most big name retail stores like Target and Walmart. 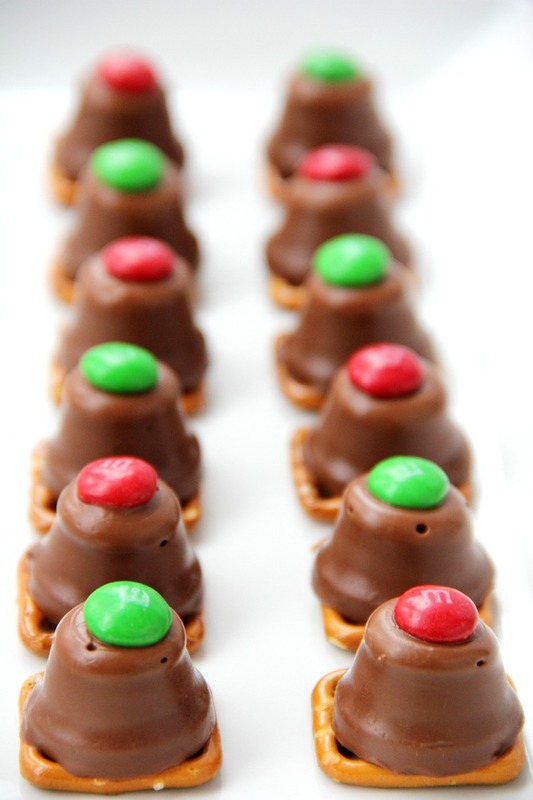 Place your pretzels onto a lined baking pan and then top them with the peanut butter bells. After warming them in the oven for about 4 minutes or so, remove them and place an M&M on top of each of the bells. Can you see how the bells take on a glossy appearance? When you see that, they’re ready. 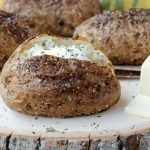 If you keep them in the oven too long they will begin to melt over the edges of the pretzels. I really had to hold myself back from making these little treats into mini Rudolphs. Can you see it? Add some candy eyes on the top of the bell along with some jagged pretzels for antlers? You can see it, right? I remember when I made these Reindeer Oreo Treats. The kids just gobbled them up! But since we’re going for absolutely “no fuss” this time around, I’ll spare you all of the intricate details. Besides, candy eyeballs can be a bit hard on the teeth and it may ruin the flavor combo we have going on here.? Served on a white platter, these treats just pop with the bright color of the red and green M&Ms. So, let’s review. So, there you have it! And remember, this holiday season, don’t overthink things and definitely don’t overcomplicate them. 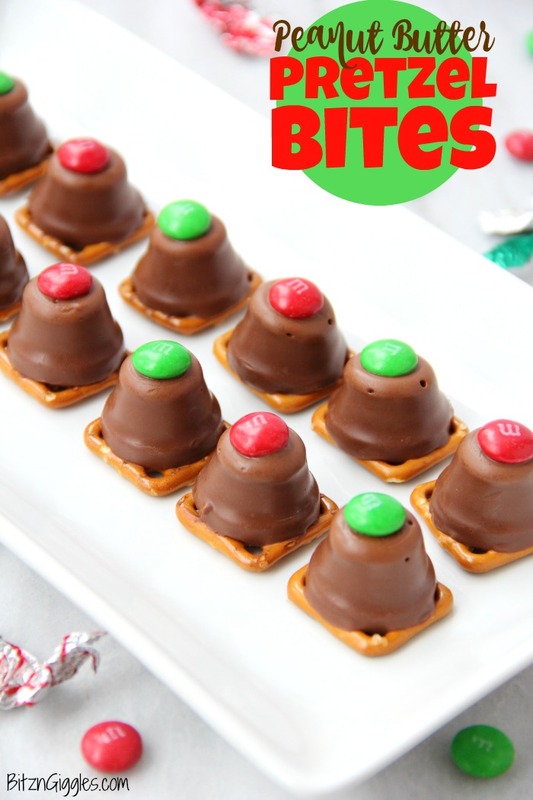 There are so many Christmas candy recipes you can make in a matter of minutes! Looking For More Sweet Christmas Treats? The whole family will love this simple and quick, three-ingredient sweet and salty treat. Great for gift giving as well! Place pretzel squares on baking sheet. 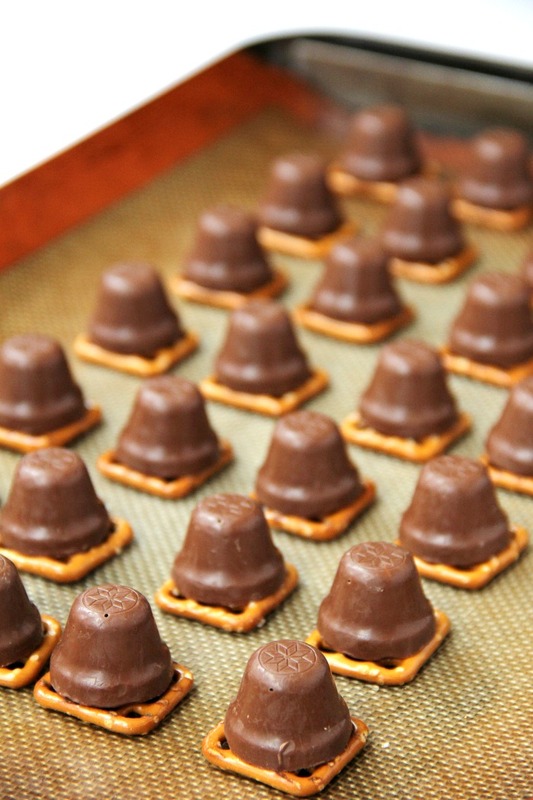 Top each pretzel with a peanut butter bell. 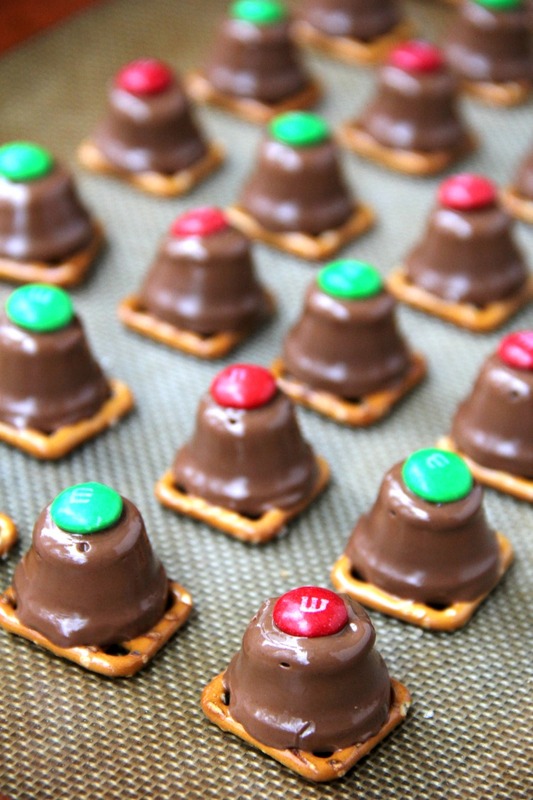 Remove from oven and place an M&M on top of each bell while still warm. 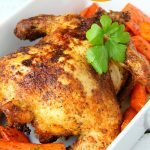 Place in the refrigerator for 15-20 minutes to set. I’ve never tried to these with peanut butter but they have to be super good. We really enjoyed them, Megan! I hope you try them!